Erik van Veenendaal is an internationally recognized testing expert, author of a number of books and has published a large number of papers within the profession. He is currently working as an independent consultant and as the Chief Executive Officer (CEO) of the TMMi Foundation. Drs. Erik van Veenendaal CISA graduated at the University of Tilburg in Business Economics. He has been working as a practitioner and manager in the IT-industry since 1987. After a career in software development, he moved to the area of software quality, where he specializes in software testing. As a test manager and test consultant he has been involved in a great number and variety of projects. He has implemented structured testing and reviews and inspections, and as a consultant has contributed to many test process improvement projects. He worked for Sogeti as manager of operations and was one the core developers of the TMap testing methodology. He is the author of numerous papers and a number of books on testing and software quality, including the best-sellers ‘Test Maturity Model integration (TMMi)’ and ‘ISTQB Foundations in Software Testing’. Erik van Veenendaal is the founder of Improve Quality Services BV, a company that provides consultancy and training services in the areas of testing, requirements engineering and quality management. He has been the company director for over 12 years. Within this period Improve Quality Services became a leading testing company in The Netherlands focused on innovative and high quality testing services. Customers were especially to be found in the areas of embedded software (e.g., Philips, Océ en Assembléon) and in the finance domain (e.g., Rabobank, ING and Triodos Bank). Improve Quality Services was market leader for test training in The Netherlands both in terms of quantity and quality. Nowadays Erik is living in Bonaire (Caribbean Netherlands) and occupied as an independent consultant doing consultancy and training in the areas of testing and requirements engineering. He also publishes and delivers presentations on a regular basis. In addition, he is actively involved in the TMMi Foundation, International Software Testing Qualifications Board and the IREB requirements engineering organization. Erik, being one the initiators to found the TESTNET organization, is by now an honorary member of TESTNET (the Dutch Special Interest Group in Software Testing). Erik was the first person to receive the ISEB Practitioner certificate with distinction and is also a Certified Information Systems Auditor (CISA). He is a regular speaker both at national and international testing conferences and a leading international (ISTQB accredited) trainer in the field of software testing. Erik has also been a senior lecturer at the Eindhoven University of Technology, Faculty of Technology Management for almost ten years. From 2005 – 2009 he was vice-president of the International Software Testing Qualification Board (ISTQB). 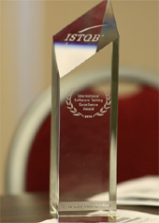 For many years, he was the editor of the ISTQB “Standard Glossary of terms used in Software Testing” and a member of the editorial board of Testing Experience. For his major contribution to the field of testing, Erik received the “European Testing Excellence Award” in December, 2007 and in the “ISTQB International Testing Excellence Award” in October, 2015. In addition to family and work, Erik likes to spent time on sports. He plays table tennis and keeps fit. He has been playing table tennis since his youth on at a reasonable level. He has played for TTV Red Stars (Venraij), TTV Bergeijk and for TTC Waldniel in the German league. He played at the world championships in Rotterdam (The Netherlands, 2011) and Dortmund (Germany, 2012). 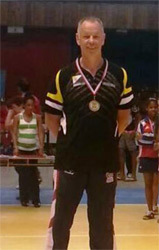 During the Caribbean championships at Havana (Cuba) in 2014 he won the bronze medal (photo). He is a six times champion of Bonaire in men’s-single and three time champion in doubles. He also plays the guitar and is a huge Bruce Springsteen fan and has visited several of his concerts throughout Europe.